Wallworks Value Engineering Saves Construction Time and Ensures Quality. In the mid-Atlantic region, winter weather conditions present numerous challenges to construction that negatively affect building schedules, performance and productivity. 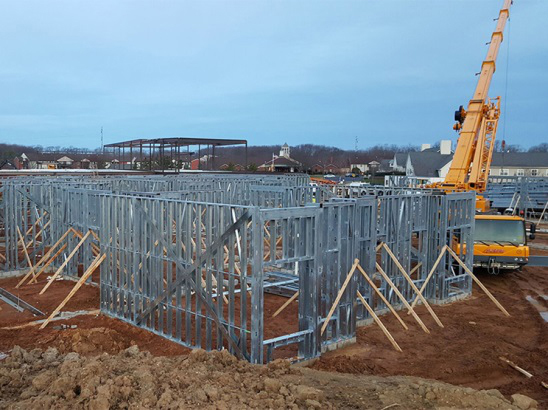 When Wallworks reviewed the construction schedule for a newly awarded project in New Jersey, they recognized the challenge to meeting the schedule. 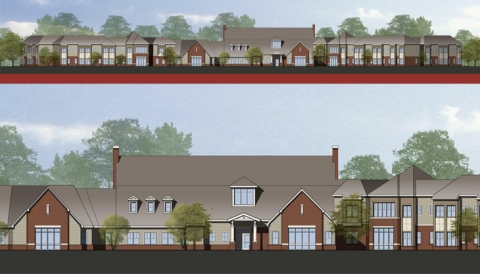 The plans for the 86,000sf, two-story skilled nursing facility specified a conventional ‘stick frame’ building to be constructed on a masonry foundation with construction beginning in October. “It was imperative our walls were up as quick as possible to allow for temporary heat. As winter approaches, any possible delay will back up the interior trades at the end of the project causing overtime costs and quite possibly sub-standard quality,” said Justin Henzel, General Manager of Wallworks. Because of extensive underground work within the building, the concrete slab on grade was scheduled into the dead of winter so the exterior walls were needed to retain the heat for a winter slab pour. To address the possible delays associated with weather, Wallworks proposed an alternate to panelize the cold-formed metal framed exterior. By taking the work off-site to a controlled environment, the effects of weather-related delays and interferences were minimized. Wallworks’ team worked alongside the General Contractor, E. Allen Reeves, to establish a revised schedule and phasing plan that incorporated the use of the panelized system and met the client’s schedule. Construction began in October 2015 and was scheduled to be completed in 1 year on a fast-track schedule. Wallworks was contracted to provide exterior and interior framing, cold-formed metal trusses, insulation, rough carpentry, drywall, doors and frames, ACT, and specialty finishes. Their scope of work ran for 9 months. Using the panelized system cut 2 weeks per floor per wing for a total of 8 weeks in time from the original schedule. It also eliminated the potential for additional weather-related delays. Panelization is the prefabrication of exterior or interior wall assemblies, manufactured in a controlled environment using conventional building components. Panelized wall systems combine time-tested building methods with modern technology. Built in a climate-controlled environment, this method eliminates the productivity delays associated with an on-site stick-framing process in bad weather conditions. For the Project, Wallworks contracted with Panel Systems Inc. (PSI). Quality control and trade coordination included a 2-part submittal process: First, an overall engineering submittal was made, including design criteria and calculations, plans, sections and details. Second, individual panel elevations and site layout plans were prepared and submitted following approval of the Engineering Submittal. In addition to improving the schedule, the system offered environmental benefits. Cold-Formed Metal Framing is a 100% recyclable product, local manufacturing plants and low product weight minimize the “carbon footprint” of shipping, and off-site construction reduces job-site waste. These attributes contribute to LEED-NC points and contribute to Wallworks’ commitment toward stewardship of the environment. The project, designed by Noelker & Hull Architects of Chambersburg, PA, is a new two-story, 86,000 sq ft. Skilled Nursing facility on the campus of Monroe Village, part of Springpoint Senior Living. The new facility adds 120 beds to the existing community, with amenities like activity centers, country kitchens, on-site physical therapy & exercise facilities, and a special residential wing dedicated to memory support. Our problem solving approach is just one more reason why contractors can depend on Wallworks to deliver value on your projects. For more information about how Wallworks can add value to your project, contact Wallworks’ General Manager Mr. Justin Henzel at JHenzel@WallworksInc.net.